Welcome to the Trimcraft team, tell us a little bit about yourself. I am a mother of two gorgeous children and a very understanding husband who all let me craft until my heart’s content. My daughter often joins in or uses my scraps for her own projects. I am a PTA mum, helping to organise fundraising events and I love being a part of my children’s school. My youngest starts ‘big school’ this September and my oldest moves to the junior school. With my new job it’s all change in the Hodson household! What is your new job role within the company? As Craft Coordinator I will be showing you how you can use the wide range of fantastic Trimcraft products for your crafting projects. I always try to think of new ideas so it won’t just be cardmaking and scrapbooking but also home décor, gifts, wrapping and upcycling. You will see me regularly on Create & Craft TV and its sister station in the US, as well as a few YouTube tutorials. I hope to be able to share my makes with you on the blog too and across my social media profiles. What can we expect from your Create & Craft shows? Hopefully lots of enthusiasm and inspiration. There will be some fabulous offers and we have some very exciting new ranges to show you. I am only just starting out, but so far it’s been very enjoyable. I thought I knew (and owned) most products but there is so much more that I am discovering. Every day is like Christmas …. Well, we are launching the Christmas stock now so I am feeling very festive anyway but with all the goodies to try out and demonstrate it feels like Christmas every day! Even after a short time with the company I can tell that everyone gets on well and it feels like a fantastic working environment. Everyone is extremely friendly and we all have opportunities to voice our opinions and have a say in decision making. Now that’s just impossible to answer! There are so many! I do go back to the First Edition Paper Flowers pad regularly as Louise Tiler’s designs are just so versatile. There are geometric patterns, wildlife, flowers, some plain designs in there too and of course the textured, pearlescent and spot UV designs are stunning for a huge range of craft projects. What has been your proudest achievement at Trimcraft? So far, landing myself the job! I’m in my first week so I hope there will be many more to come! With live TV on the horizon though there may be a few minor hiccups that I won’t be so proud of!!! Crafting and making (obviously! ); I sell personalised gifts on Etsy. I am also very happy in my kitchen baking and decorating celebration cakes and cupcakes and often get asked to make them for friends and family. When I am not making or creating you’ll find me browsing Instagram and Pinterest for more ideas I will never have time to getting round to making! Aside from being creative, I enjoy a bit of downtime every week at the pub quiz. I usually think of an occasion to craft something specific for. For example Father’s Day, Christenings, Birthdays, etc. I use my family as inspiration and think of what they would like to receive in a gift or card. I also love reading the crafts, papercraft and card making magazines; the fantastic things people create never cease to amaze me. It’s a cliché but I would definitely take my extended family away for a holiday. I have many aunties, uncles, cousins and second cousins, some in far flung corners of the globe, so it would be wonderful for us all to get together for a good catch up. Then I’d go mad buying craft supplies and probably purchase a bigger house to keep it all in! Where to start? I once climbed a pylon with the chief executive of National Grid! And I can’t knit or crochet. GASP!!! I speak French and spent ten years working in a PR consultancy. 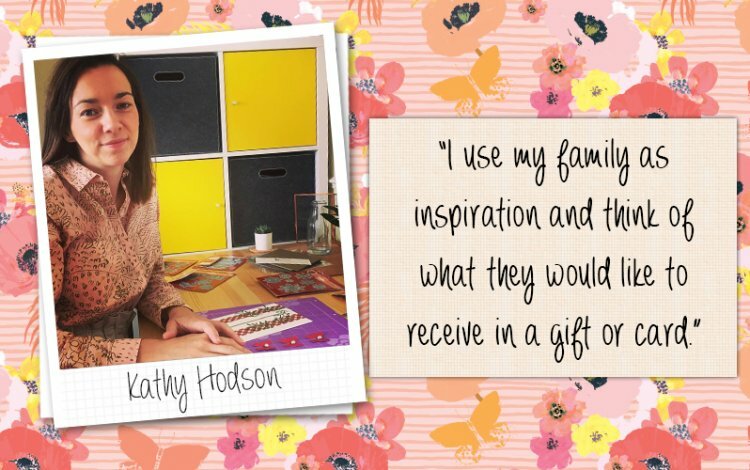 Keep posted on social media of when Kathy will be on Create and Craft TV so you can see her use our latest papercraft collections in new and brilliant ways! Search Kathy Crafts TV on Facebook, Instagram and Twitter to keep up to date with her show times and fabulous crafts!